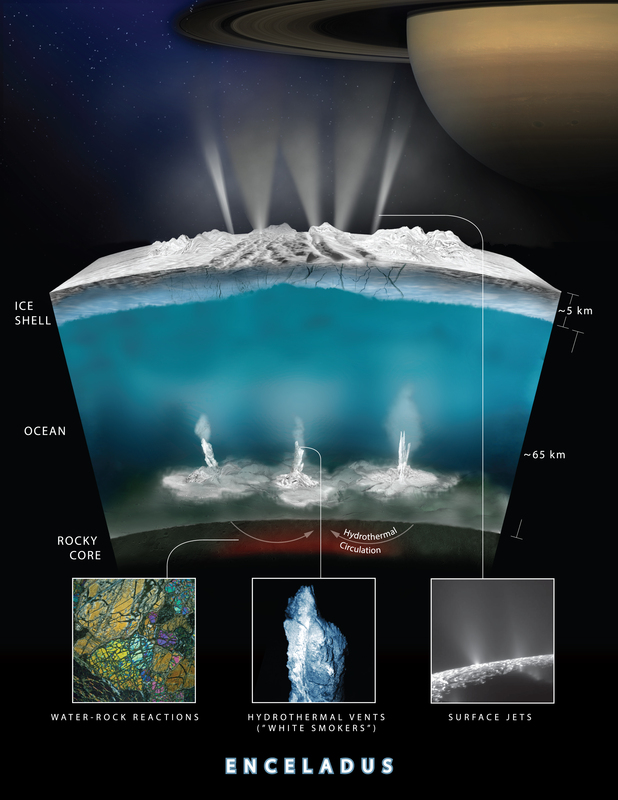 August 24, 2017 – NASA’s James Webb Space Telescope will use its infrared capabilities to study the “ocean worlds” of Jupiter’s moon Europa and Saturn’s moon Enceladus, adding to observations previously made by NASA’s Galileo and Cassini orbiters. 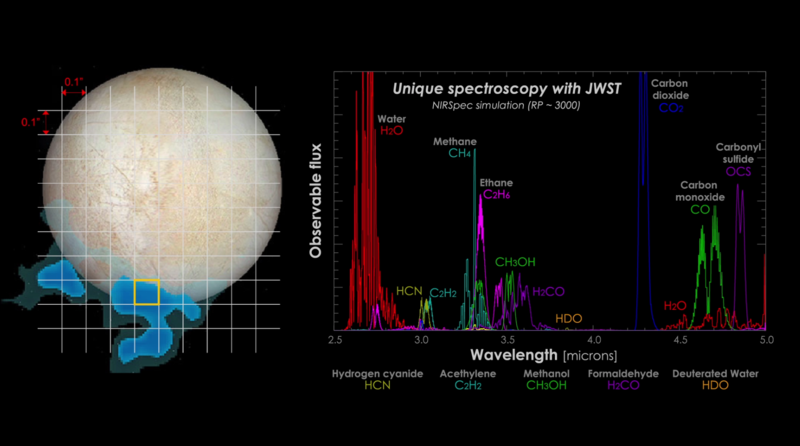 The Webb telescope’s observations could also help guide future missions to the icy moons. Europa and Enceladus are on the Webb telescope’s list of targets chosen by guaranteed time observers, scientists who helped develop the telescope and thus get to be among the first to use it to observe the universe. One of the telescope’s science goals is to study planets that could help shed light on the origins of life, but this does not just mean exoplanets; Webb will also help unravel the mysteries still held by objects in our own solar system (from Mars outward). Geronimo Villanueva, a planetary scientist at NASA’s Goddard Space Flight Center in Greenbelt, Maryland, is the lead scientist on the Webb telescope’s observation of Europa and Enceladus. His team is part of a larger effort to study our solar system with the telescope, spearheaded by astronomer Heidi Hammel, the executive vice president of the Association of Universities for Research in Astronomy (AURA). NASA selected Hammel as an interdisciplinary scientist for Webb in 2002. Of particular interest to the scientists are the plumes of water that breach the surface of Enceladus and Europa, and that contain a mixture of water vapor and simple organic chemicals. NASA’s Cassini-Huygens and Galileo missions, and NASA’s Hubble Space Telescope, previously gathered evidence that these jets are the result of geologic processes heating large subsurface oceans. “We chose these two moons because of their potential to exhibit chemical signatures of astrobiological interest,” said Hammel. Villanueva and his team plan to use Webb’s near-infrared camera (NIRCam) to take high-resolution imagery of Europa, which they will use to study its surface and to search for hot surface regions indicative of plume activity and active geologic processes. Once they locate a plume, they will use Webb’s near-infrared spectrograph (NIRSpec) and mid-infrared instrument (MIRI) to spectroscopically analyze the plume’s composition. For Enceladus, Villanueva explained that because that moon is nearly 10 times smaller than Europa as seen from the Webb telescope, high-resolution imagery of its surface will not be possible. However, the telescope can still analyze the molecular composition of Enceladus’ plumes and perform a broad analysis of its surface features. Much of the moon’s terrain has already been mapped by NASA’s Cassini orbiter, which has spent about 13 years studying Saturn and its satellites. Villanueva cautioned that while he and his team plan to use NIRSpec to search for organic signatures (such as methane, methanol, and ethane) in the plumes of both moons, there is no guarantee the team will be able to time the Webb telescope’s observations to catch one of the intermittent emissions, nor that the emissions will have a significant organic composition. “We only expect detections if the plumes are particularly active and if they are organic-rich,” said Villanueva. Evidence of life in the plumes could prove even more elusive. Villanueva explained that while chemical disequilibrium in the plumes (an unexpected abundance or scarcity of certain chemicals) could be a sign of the natural processes of microbial life, it could also be caused by natural geologic processes. While the Webb telescope may be unable to concretely answer whether the subsurface oceans of the moons contain life, Villanueva said it will be able to pinpoint and better characterize active regions of the moons that could merit further study. Future missions, such as NASA’s Europa Clipper, the primary objective of which is to determine if Europa is habitable, could use Webb’s data to hone in on prime locations for observation. The James Webb Space Telescope is the scientific complement to NASA’s Hubble Space Telescope. It will be the most powerful space telescope ever built. Webb is an international project led by NASA with its partners, ESA (European Space Agency) and the Canadian Space Agency.